Licence: US$4.99 Universal App (runs natively on both iPhone/iPod Touch and iPad). Compatible with iOS 4.2 or later. 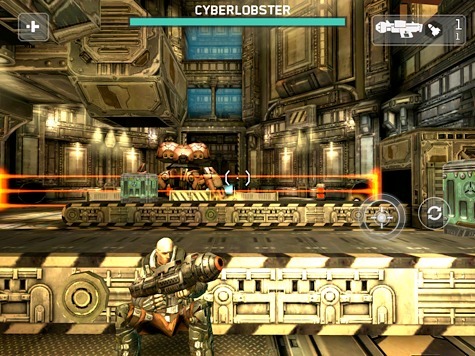 SHADOWGUN delivers an audio and visual experience rarely seen on portable gaming platforms. It is the new benchmark for all games to follow. It is the year 2350. John Slade, a gun for hire, is on the hunt for a geneticist whose experiments have exceeded the acceptable level of his employer, Toltech Enterprises. As you journey through this futuristic world you will have to annihilate hordes of mutated creatures. They are the minions of the crazy wild-eyed scientist Dr. Edgar Simon. John Slade is joined by S.A.R.A., a personal android assistant. The banter between characters brings a sense of realism, sarcasm, and humour to the storyline. The game is a third person shooter that has ten levels of non stop action, more than five hours of gameplay, and a series of interesting boss battles along the way. You are armed with an all-purpose weapon when starting the campaign. For most opponents this will be sufficient. You will be able to pick up additional weapons as you proceed. Each weapon has a specific purpose and will inflict more damage on certain opponents. As you proceed through the game you will come across hidden items that will unlock additional information regarding the SHADOWGUN universe. In this type of game it is not uncommon for enemies to lack a sense of life. Instead of standing there waiting to be shot they will work as a unit for both arial and ground assaults. There is a reasonably diverse range of enemies to keep you busy. Some are more challenging than others. Enemies will also take cover and should an opportunity exist they will push forward in an attempt to ambush you. Airborne enemies will come at you from all directions as will space jumping cyborgs. Controlling your character in a 360 degree view is challenging but rewarding as the game engine and controls are up to the challenge. The first thing console gamers will notice is the limited options of controls. Your character is unable to jump and there is absolutely no one-on-one hand combat. This is by no means a limiting factor. The game really doesn’t need a collection of extra controls that in many cases cause the gamer more problems than they are worth. The controls throughout the game felt responsive and suffered no noticeable delay. Visually scanning the area was a breeze when not taking cover. When you do take cover you are limited to a smaller visual range. I felt that was quite limiting in some scenes when I was aware enemies were approaching from the other side, but I was unable to locate them without moving from cover. Gamers are able to move the directional and firing virtual control pads to different locations on the the display. This makes the gameplay more pleasing especially on iPhone/iPod Touch sized screens. The graphics are simply gorgeous: the best I have yet to see on the iOS platform. Titles such as Infinity Blade and RealRacing 2 HD were my previous benchmarks. The developer has chosen to use a mix between photo realism and cell shading graphics. This produces a simply amazing vibrant visual experience. Cutscenes are equally impressive. Gamers who like to skip cutscenes may be disappointed to know there is no option to skip a scene. The scenes are not lengthy but if you just want to get back to gameplay they do slow down your progress. Visual nirvana is only part of the game. The audio is equally impressive and suits the game style and storyline perfectly with a hard rock soundtrack. When enemies are approaching and you are about to head into battle the aggression of the audio soundtrack increases and then becomes calmer once you have eliminated all enemies in the vicinity. You will notice extreme care has been taken to match the visuals with the audio. Standing under overhead industrial fans produce a sound you would expect as they rotate. Sound detail like this really adds to the atmosphere of the game. iOS devices are generally limited by a low quality small speaker on the unit. To get true audio reproduction it is generally expected that you will use a set of headphones. This game is a little different. The developer has taken the time to maximise the audio quality for the small speakers. The sound is clear with a good level of bass across all devices which is ideal for this kind of action game. There are no online or local multiplayer options with this game. Whilst this isn’t a massive disappointment it would offer additional replay value. The interest to return to the campaign once completed is minimised unless you wish to unlock all Game Center achievements. There are also alternate endings that will see you decide if Slade will help the company or destroy what they value most: the knowledge Dr. Edgar Simon has pertaining to genetically enhanced humanoids. 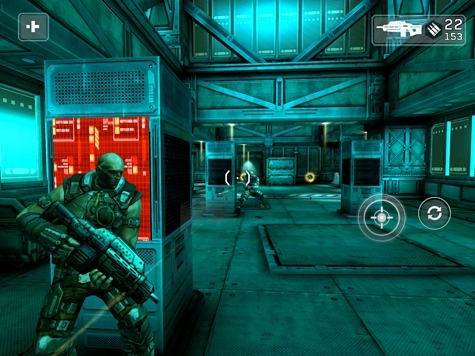 SHADOWGUN is your classic take cover, annihilate, and move on style gameplay. The boss battles give a good strategic challenge but unfortunately are not unique from other similar third person adventure/action games. When buying apps, games especially, I am always pleased to see the inclusion of universal apps that work on both an iPad and iPhone with a single purchase. The game is nothing short of spectacular. It is console quality and the execution is above and beyond what I felt could be achieved by a portable title. 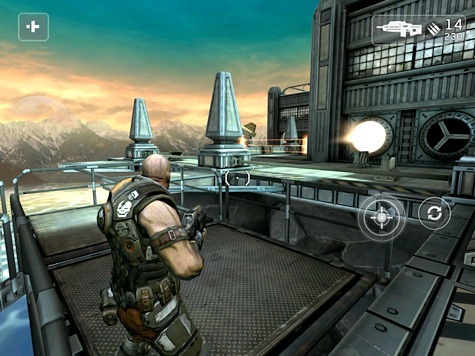 Running at 60 frames per second on the iPad 2, and 30 frames per second on the iPhone 4, neither device slowed down or appeared to struggle despite the intensity of the gameplay. The lack of multiplayer may deter some gamers, as will the relatively short single player campaign. It is good to see that MADFINGER games concentrated on delivering an outstanding single player experience. Many game developers try to please all gamers and as a result this can lead to a less than desirable experience. This game has pushed limits of portable gaming and has set a new benchmark for all other developers to reach. 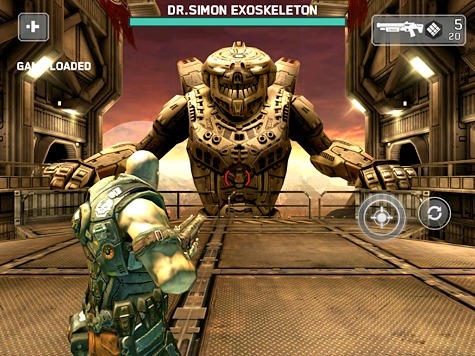 Therefore, I am awarding SHADOWGUN for iOS a MyMac review rating of 9 out of 10.